Umana's concept revolves around global street food, served in a more upscale setting. The setting itself is an extension of the menu, where you feel as though you might be stepping foot onto an old schooner that has traversed the secret corners of the planet in search of exotic flavors to sell during colonial trading times. The dark woodwork is complemented by bright colors and vibrant fabrics that merge an expected dining environment with tastes unknown to many in our area. Introducing people to new cuisines and flavors carries a responsibility. Since this is the first time many diners might be trying the flavors of, say, Ethiopia, if the kitchen staff doesn't execute with confidence and skill, the cuisine might be nixed from an eater's repertoire for good. Rest assured that Umana will provide a good introduction to Ethiopian cuisine. First, some geographic context: Ethiopia lies on the eastern coast of the African continent, so many of the flavors are akin to Middle Eastern cooking. This is not pan-African cuisine (similar to the pan-Asian constructs we are slowly removing ourselves from in the Capital Region) -- it is uniquely Ethiopian. And this is where your responsibility as eater plays a role, to remove yourself from any preconceptions on what "African" food might be. So what does the Ethiopian platter entail? The critical element here is injera, a crepe-like, rolled-up bread with a sourdough taste made from fermented tef flour. It is springy, due to the air bubbles formed during baking. Though it might seem a bit chewier than the pancakes it resembles, those air bubbles are prime reservoirs for soaking up the sauces and juices left on the platter. Some Ethiopian restaurants will serve other dishes directly on the round of injera, but Umana serves it on the side. Either way, the point of the bread is to be used as your utensil, scooping up other food and eating it in one bite. The platter also includes mixed peppers and sautÃ©ed greens, wot (a stewed chicken recipe), lentils, and chickpeas. Berbere, the classic spice and pepper mix of Ethiopia which is used similarly to curry powder or garam masala in other cultures, is prevalent across the platter. The berbere used is balanced, and the nutty and sweet notes of nutmeg, coriander, ginger, cloves, and allspice find harmony with the astringent hit of heat from the ground peppers. Unfortunately, the flavors of each offering on the platter did not contrast as much as hoped, more mimicking each other than creating their own profiles. I wouldn't necessarily take this as a deterrent from trying the platter -- this became more an exploration in textures than in distinct flavors. I wish that each recipe was a bit more bold and assertive, but try to think of this platter as a Philosophy 101 course: If the professor was to start the syllabus with, Sein Und Zeit by Heidegger (look it up) instead of, say, an overview of John Locke, only the diehards would return for week two. This is a nice primer on the tastes of Ethiopia. The platter ($18) is designed to serve 2-4 people. If given the choice between mild and spicy, choose spicy. The flavors are more complex this way, but not tear inducing. You can also ask for it as vegetarian. Call ahead to see if the platter is being served -- it is technically not on the menu and you'll have to ask for it specifically. Umana gives diners a solid introduction into classic Ethiopian fare, a cuisine all its own. The shared platter approach harkens to communal eating, which is also enjoyable. In nearly any other culture around the world, a meal is never just the food itself: It provides sustenance in many ways. 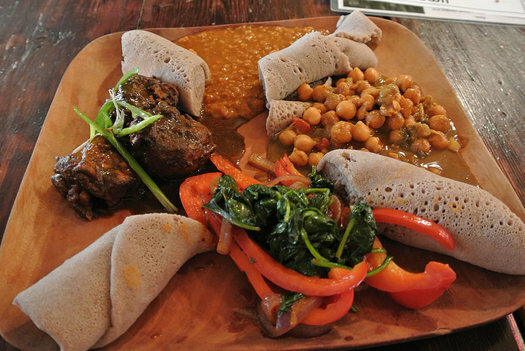 Umana's Ethiopian offering provides a glimpse into global fare and practice. Food is a direct conduit of love and a means to maintain social ties. Whether it's the convivial nature of the shared platter or the warming flavors of Ethiopian cuisine, it is easy to feel aflutter after this meal. The injera looks authentic, but I've never had it not served as the foundation of the meal with the other foods on top of it. That way it soaks up the flavors. I don't understand the rationale for serving it separately, rolled up. I'm looking forward to trying the Ethiopian platter! I haven't had Ethiopian food since leaving NJ in the late 1990's. Back in the day we used to head to NYC and check out the different Ethiopian restaurants. Maybe, one day there will be an Ethiopian restaurant in the Capital District! I visited Umana for the first time a couple of weeks ago thanks to a mention here on AOA. I used to travel to DC quite often for work, and regularly dined there on Ethiopian (DC has the largest Ethiopian population outside of Ethiopia). I brought two friends who had never tried Ethiopian before. We ordered the Ethiopian platter and a appetizer platter for a nice mix. I was very pleased with the experience all around. The staff was knowledgeable, and the menu is tight, but varied. They have a great wine list too! I would highly recommend a visit. I also have never seen it rolled up like that (and I went to grad school in Chicago, where there are a number of Ethiopian restaurants), but when I saw it, I thought it was a pretty good idea. In my experience, it gets pretty messy when you're down to the sauce-soaked bits of injera (and they get squishy--I don't like soggy breads). I like the idea of having greater control over my injera:other ratio. I'm excited to try this out when I'm back in the 518 next month.